As a lily is said to be spoilt by gilding, so the ancient teachings of the sages have been gilded by numerous hands over many centuries, each adding a layer of belief, terminology, or methodology. Baba Shivarudra Balayogi's teachings are based on His own direct experience, cleansed of confusion, and resplendent in their simple beauty. The truth is easily recognisable by a genuine spiritual seeker and resonates deep within. 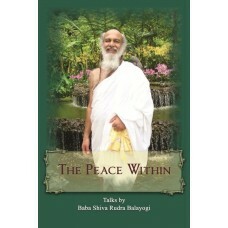 Baba's wisdom and warm sense of humor come through in this second book in the 'Heart of Peace' series, 'The Peace Within' - a collection of His talks and questions and answers from public programs held around the world. Many basic and diverse questions on spirituality and the practice of meditation are answered with the absolute clarity of someone who has achieved Realization.